At the end of the final episode the kids tell their father that the whole story began with him meeting and falling in love with Robin and that’s why Ted began telling his story from that point in time but they are very wrong. The story really begins with Lily and Marshall getting engaged. This is when Ted realizes that he wants what they have and that revelation is when his quest begins. I always thought of Robin as ‘the one that got away’ (lets face it almost everyone has one) and think that would have been a far more profound ending than simply killing off the mother and Ted ending up with Robin after all. Also, I thought the kids were far too nonchalant about losing their mother. Even from the very beginning they were bored and couldn’t wait for Ted to get his story over with which considering the kids would have been what? 11 and 9 years old when their mom died you would think they would relish every story instead of just rolling their eyes every chance they got. 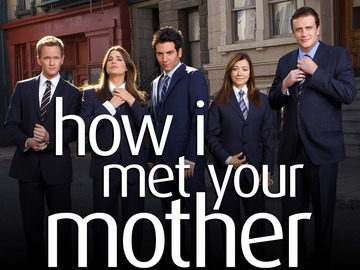 And lets not forget all the build up over the years; the just missed meetings, the overlaps in the lives of Ted and Tracy, not just with Saint Patrick’s Day and the yellow umbrella but also Cindy the roommate, Ted teaching the wrong class, The Naked Man, Tracy’s friend going to the wrong Mclarens and others I can’t think of at the moment but I’m sure exist. The mother should have been the light at the end of the tunnel, the end of the quest, not just a stop over so that Ted could have the kids he so desperately wanted before settling down with Robin. To be fair though, they’ve been locked into this ending since season one. The actors who play the kids (Lyndsy Fonseca and David Henrie) are well into their twenties now so having them back to shoot the final scene would have been weird (am I the only one that finds it creepy that Lyndsy is now old enough to play her own mother?). Of course they could have shot a bunch of alternative endings which would have made sense as the story evolved over the past decade and simply chose to settle on this one. If that’s the case I hope we’re treated to the alternative endings as extras on the DVD release (that way each person can choose the ending they like best). Also, giving the mother the same name as the stripper from the first season (Belly Full of Turkey) was a clever bit of foreshadowing. So, was this the ending I was hoping for? Not really. Is it the ending I was expecting? In some parts, yes. It was obvious Robin and Barney just wouldn’t work out (mind you if The Exploding Meatball Sub is anything to go by they do keep in touch) but in the end things rarely ever work out the way we want them to and maybe that has been the point all along.